Albumen print of a plaster figure by the sculptor, James Redfern,(1837-1876), who designed the figures of the Virtues, of which this is the figure of Faith, in about 1865 to 1867, for the flèche of George Gilbert Scott's design of the Albert Memorial. The plaster figures were electroformed in copper by the firm of Francis Skidmore (1817-1896) known as Skidmore's Art Manufactures and Constructive Iron Company at Alma Street, Coventry. Then the figures were gilded in situ once mounted on the spire. The Albert Memorial, Hyde Park, London, was completed in 1874, to commemorate Prince Albert. This albumen print functions as a record for Skidmore's firm. 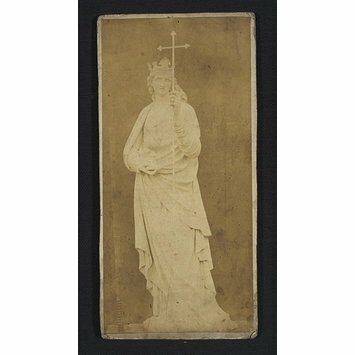 Photograph of a plaster, crowned figure holding aloft a cross and a chalice in the other hand. 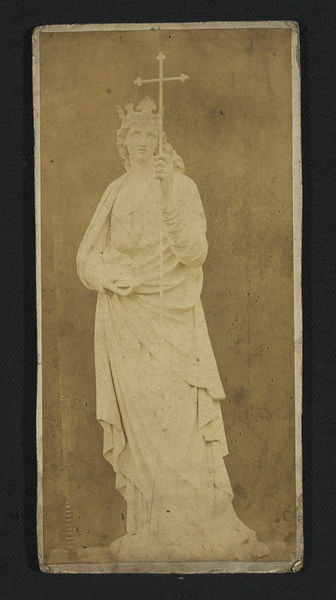 Albumen print of the plaster model of the figure of Faith, one of the Virtues, for the Albert Memorial by James Redfern. Brooks, Chris, ed. The Albert Memorial. New Haven and London: Published for the Paul Mellon Centre for Studies in British Art by Yale University Press, 2000. 281 p., ill.
Read, Benedict and Ward-Jackson, Philip. Courtauld Institute Archives. Archive 4: Late 18th & 19th Century Sculpture in the British Isles. Harvey Miller Publishers in association with The Courtauld Institute of Art, University of London, 1976. 4/1/108 p., ill.
James Redfern designed the figures of the Virtues, of which this is one, for the flèche of George Gilbert Scott's design of the Albert Memorial. The plaster figures were electroformed in copper and gilded by Francis Skidmore's firm Skidmore's Art Manufactures and Constructive Iron Company at Alma Street, Coventry. Attribution note: There is a ruler at the left side by the figure which has the measurements 1-6 that are presumably in feet.